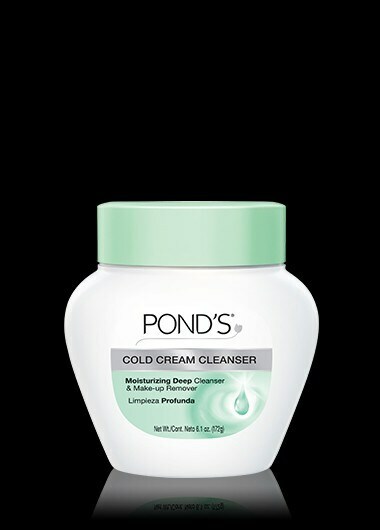 Pond’s Cold Cream removes makeup and improves skin’s moisture, texture, and smoothness. Unlike ordinary makeup removers, Pond’s Cold Cream is 50% moisturizer. It melts away all traces of your toughest makeup, while infusing skin with vital hydration. Clean, soft, glowing skin – all in one step! It deep cleans and removes dirt and makeup, even stubborn waterproof mascara, while infusing your skin with vital moisture - all in one easy routine. Dermatologist tested, suitable for sensitive skin and won't clog pores. Cold Cream Cleanser is rated 4.1 out of 5 by 10436. Rated 5 out of 5 by emarie0974 from My forever Company I started to use Ponds Cold Cream Cleanser since I was a teenager. The Best thing of this cream is that I can come late home and the removal of the make up is in 1, 2 and 3. I never go to sleep with make up, because Ponds Cold Cream Cleanser is easy, secure and leaves my skin clean. I always combined Ponds Cleanser and the Moisturizer. You can have high quality of products and don't spend a fortune Ponds Cold Cream is part of my family for generations. Now, my daughter is using it. Today when the woman is more busy and with more responsibilities I want a product that can leave my skin, clean, soft and ready without spending a fortune. Ponds, you are my forever company. . Rated 1 out of 5 by vbvb from Rash, itching, burning I have used the original cold cream, liberally, for over 20 years. I hadn't realized that the product had changed to a "cleanser" until I began to experience blotchy, burning, itchy bumps around my eye area. Very red, very dry allergic reaction. And remarkably noticeable. I went to see a dermatologist who suspected it was a form of contact dermatitis -but at the time we couldn't identify the cause. If I'm writing this, there must be many many others experiencing the same skin reactions. At least offer the old product to loyal users, because it may cause you to lose a broader customer base that you forecast. Rated 5 out of 5 by Eacjae from HIGHLY RECOMMENDED!!! Over the years I have spent a fortune buying into the usual high end products which have convinced me they will give me beautiful skin!! - What a waste of my money. Then recently I saw a jar of Ponds cold cream cleanser and it reminded me of an elderly great aunt who had always used Ponds and as a result had the most beautiful skin. So I bought a jar. 2 weeks later, my sister commented on how lovely my skin was looking and asked what I had done differently. I told her - and she immediately dashed out and bought a jar herself. I also suggested my 23 year old daughter use it and she too was amazed and has decided to use it. Don't think about it... buy it. It will be the best money you ever spend!!! Rated 1 out of 5 by cmhayes4155 from Very Disappointed! All the women in our family have faithfully used Ponds until the formula change. It wasn't the Ponds Cold Cream we loved . The first problem was the fragrance the familiar nice scent gone replaced to what seems to be no scent. The consistency of the cream had no resemblance of what cold cream has always been known as cold cream. It now is like other creams on the market rather being the product generations have associated a pure cold cream. The women of this family will not be buying the new formula as it is no longer the cold cream that has always been cold cream in the past. Rated 1 out of 5 by Joemama from Bring back the old cold cream I've used Pond's for over 10 years in the dry winter months. It used to be a simple, soothing product. This last winter I bought my first container of the winter (which here in the upper Midwest lasts about half the year) and noticed it was different. I used it anyways and broke out everywhere I put it in little red, sore spots. I noticed the ingredients changed for the worse. What gives?! Why mess with a perfect product!? New Coke...hello? I can't use this imposter product and it made me so mad I've stopped buying the wipes as well. Rated 5 out of 5 by Munra from Pond's Cold Cream Remembered I had the flu and my skin was very dry. I also am peeling from products for hyper- pigmentation. I used expensive cream to hydrate by 62 year old skin that is free from wrinkles. I am so glad that as I walked the aisles at the drug store that I remember the older women in my life swearing by Pond's. I used in one night and woke up to skin that was soft and supple; and, not peeling!!! Pond's is now part of my daily regiment and for use at night time along with my the products used to ease my hyper-pigmented skin. Thanks for the memories the Old is sometime better than the new. POND’S® Rejuveness Anti Wrinkle Cream reduces the appearance of fine lines and wrinkles in 2 weeks. This daily moisturizer is formulated with Alpha Hydroxy Acids (AHAs) and collagen. AHAs is an ingredient known to gently remove dull surface skin cells and smooth fine lines, while collagen is a fiber known to support skin firmness and elasticity.